There’s only one major exception to the gently undulating terrain near Winston-Salem: The Sauratown Mountains, a small range about 30 miles northwest of here. 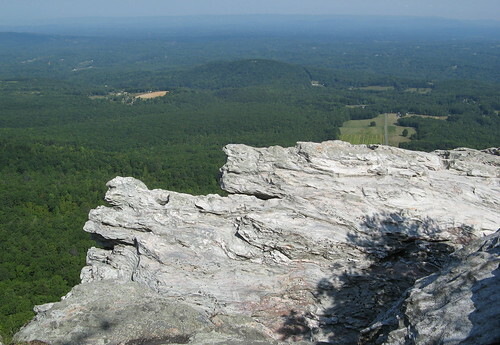 Centerpiece of these neighboring peaks is Hanging Rock State Park, so named because of large rock formations that, you guessed it, hang out over the terrain below. 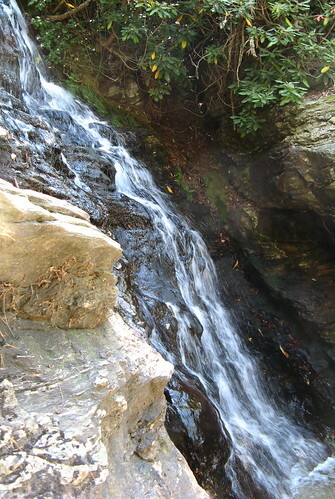 Hanging Rock has two things I crave: interesting stone and multiple waterfalls. Last week a couple hikers from Georgia urged me to check it out. Sage advice. Note that two of Hanging Rock’s most noteworthy waterfalls — the Upper and Lower Cascades — require less than a mile of easy hiking, so they attract crowds (and the occasional wedding, as I found out yesterday). 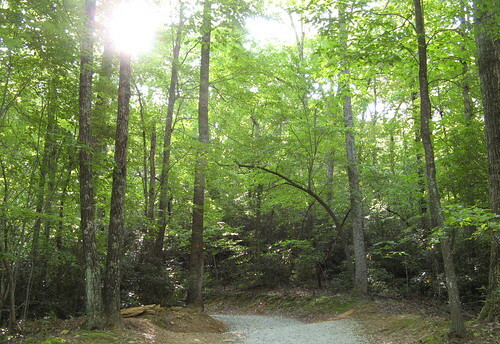 Thick forest canopy at the beginning of the Hanging Rock Trail. It’s uphill the whole way with few switchbacks. Starts out paved, then gets unpaved, then gets narrow, then gets very rocky as you near the top. It was a lot tougher than I expected. Thankfully, an expired tree provided a photo opp along the way. 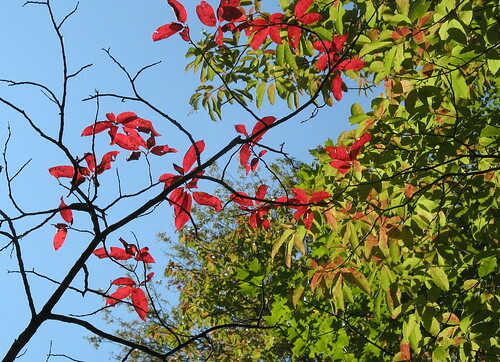 So it goes up and up and up, then there’s a break in the trees and you look up and see — surprise! — these rocks hanging right over the trail. These teenage girls passed me like I was standing still on the way up (because I actually was standing still, catching my breath). Then their moms passed me. I got to the top before their grandmothers showed up, fortunately. More rock, with farmland beyond. 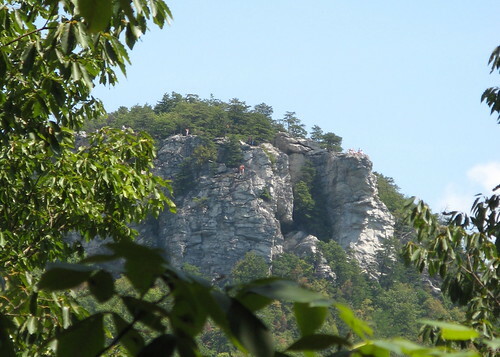 Like most Main Attractions, Hanging Rock gets crowded, but as with just about every other park, you have the rest of the trails to yourself, pretty much. I headed back down and took a left turn on the Wolf Rock Trail, which starts out narrow with the forest brushing at your elbows for the first half-mile or so. Then the trail gets closer to the rocks, which are pretty nice, though admittedly less spectacular than Hanging Rock. 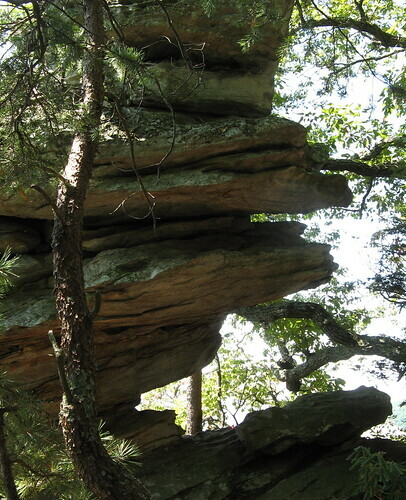 Another of my favorite tree-growing-out-of-rock shots. This stand was particularly impressive. I headed back on the Magnolia Springs Trail, which, as billed, has many springs. The trail itself is very narrow, even overgrown a bit in places, which creates a kind of intimacy with the forest that can be an unexpected pleasure if you’re not claustrophobic by nature. Some color along the way. Eventually the trail parallels a small lake. 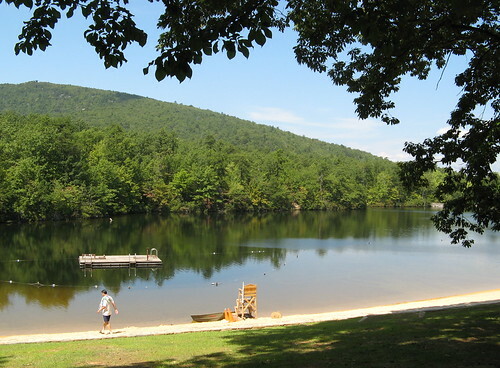 There’s an open-air lodge where you can rent a boat or buy a Coke (just 50 cents!) or a snack. After that I checked out Upper Cascade Falls. Wouldn’t put Yosemite out of business or anything, but it’ll do. 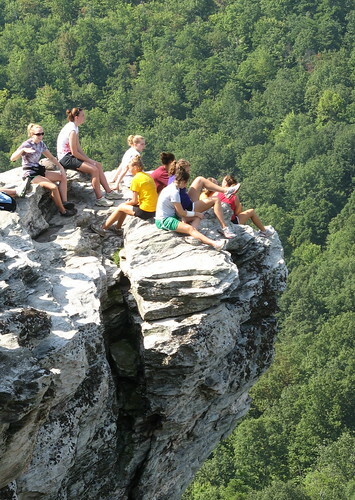 So that’s a first look at Hanging Rock State Park. There looks to be about 20 miles of trails at the park, so there’s lots more exploring to be done there. 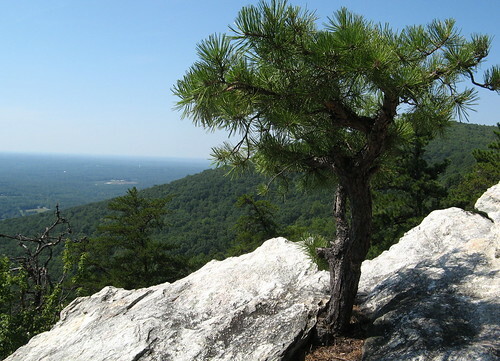 This one and Pilot Mountain are about as hilly as it gets within 50 miles of the Triad. 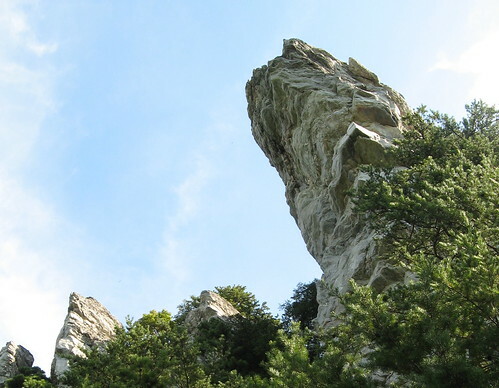 NC Parks Department’s Hanging Rock page. 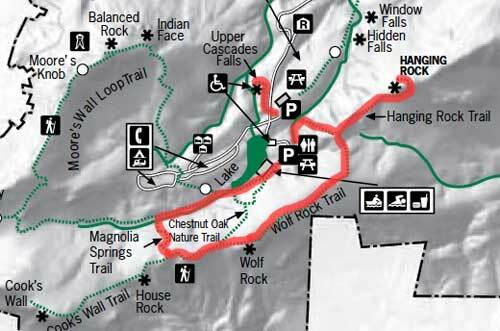 NC Waterfalls Guide to Hanging Rock. Pretty nice looking hike Tom, again with some great views in it too. And nice to see the new tree motif of growing out of a rock but at the same time, nobody’s got anything on you when it comes to dead snag pictures. I know its green and all there but I hope you find some of those to take too. And you have suitable shamed me, given that I have been a couch potato all summer nursing my knee. It’s feeling good now and I went out hiking today out of Hunting Hollow. Hiked up the Phegley Ridge Trail to Wagon Road and down and around to Willson camp for lunch, then up to Willson peak for the views and then down the Middle Steer Ridge Trail. I was a great day out and I had a great time. So keep shaming me so I keep getting out there too! Cynthia: That’s a lotta Coe for somebody with a bum knee … I think if I was going to shame you it’d be in the direction of taking it a little easier on yourself on the trail. Tom, you’re right. Fortunately my knee held up for it. I was most worried coming down that Middle Steer Ridge trail. That thing is plenty steep and with lots of ball bearing gravel to send you flying but I I made it. I banged up my knee back in June jumping down maybe 4-5 feet on rock around a lighthouse trying to get from one place to the next. I didn’t break anything, and X-rays of it were negative, but I did strain the soft ligaments or tissues. At various times early on, when dong simple things like climbing stairs the knee felt like it was going to explode, buckle and come completely apart at the seams. 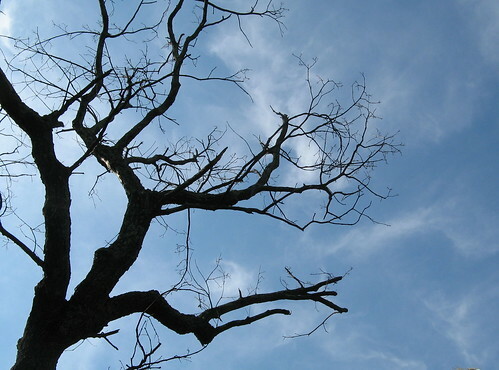 It was an icky wired feeling and I had considerable pain when walking. But after laying off it for three months, it feels back to normal and my doctor gave me the OK to hike. I did the hike with a friend so I wasn’t alone out there but I have to admit that I still wouldn’t want the knee to go bad back in the deep dark recesses of Henry Coe. And needless to say, I’m tired this morning but the knee is fine, YAY! Tom, that’s some very beautiful country you’re exploring, and you’ve got the pics to prove it. My partner Stephanie wants to take me back east someday. It’s good to know you’re scouting out the prime hiking spots. Beauty is found wherever the eye of the beholder beholds! Looks lovely! And even if you have to drive 100 miles occasionally for some “bigger and better” stuff, so be it! Go for it! It’s all around you!